It is said that there are 5.25 trillion pieces of plastic littering our oceans. Surprisingly, up to 80% of that debris started off on land. Chad Pregracke is stepping up to do something about this problem! Chad grew up on the Mississippi River in Hampton, IL and worked as a commercial mussel diver and camped along the river’s shorelines. There, he saw tons of trash and knew it had no place in the scenic river, his backyard. To help protect rivers, Chad decided to start the not-for-profit, Living Lands & Waters (LL&W) in 1998 at the age of 22, and dedicate his life to cleaning America’s rivers. What started with one man and one boat now equates to the only industrial strength river cleanup organization in the world! With the help of over 100,000 volunteers, Chad and his crew have removed close to 10 million pounds of trash from the Mississippi River basin. Spending up to 9 months a year living and traveling on a barge, the Living Lands & Waters' crew host river cleanups, watershed conservation initiatives, workshops, tree plantings and other key conservation efforts. One way that LL&W is working to keep our rivers clean is by education. Living Lands & Waters offers free, environmental science workshops on its floating classroom. The goal of its student workshops is to expand awareness of environmental issues and responsibility encompassing the river, as well as to create a desire in these students to protect it. Living Lands & Waters is proud to partner with Earth Echo International by engaging its students in the Water Challenge! By using LaMotte water quality testing kits, students from around the Mississippi River Basin will collect and analyze data on LL&W’s floating classroom. 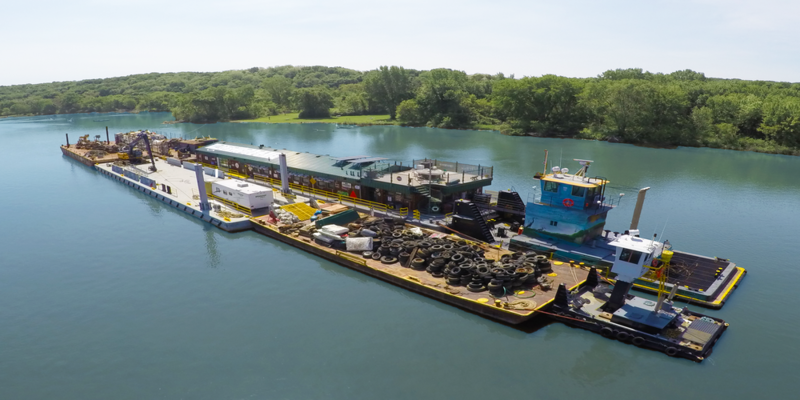 This fall, the LL&W fleet will makes its way down the Ohio River, starting in Ripley, OH and ending in New Amsterdam, IN hosting river cleanups and education workshops along the way. Students in the Ohio River Watershed will be conducting water quality experiments aboard the floating classroom, and the LL&W crew will log the data in the EarthEcho Water Challenge Data Base. LL&W is excited for this partnership to bring more real world examples of water preservation into the classroom! For more information, please visit www.livinglandsandwaters.org. Editor’s Note: Meghan Elgan is the Education Coordinator for Living Lands & Waters. At EarthEcho International, we’re honored to partner with Living Lands & Waters to support their efforts to connect young people to their water resources and empower them to protect their local waterways. Stay tuned for more on our collaboration!